Shaftesbury (Anthony Ashley Cooper): Band II,3: Des Maizeaux’ French translation of parts of ›An Inquiry concerning Virtue‹ u.a. 338 p., 17,2 x 24,4 cm. 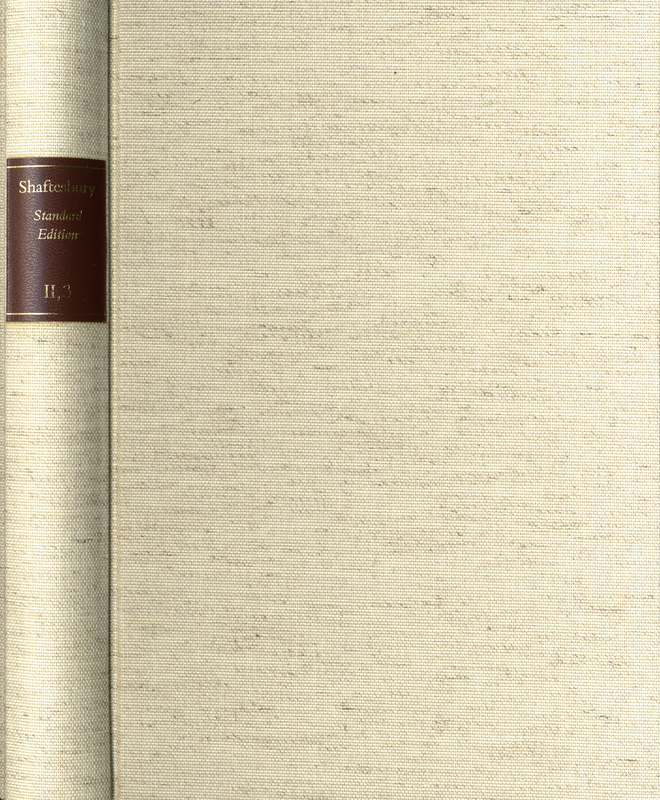 Irrtümlich wurde in diesen Band eine nicht korrekte ISBN (3-7728-0760-7) gedruckt; diese gilt für Band II,2 der Ausgabe. Advisory co-editors: A. Owen Aldridge and Karl-Josef Höltgen. The German translation of ›The Moralists‹ and ›Inquiry‹ appears here separately for reasons of space, the English originals having been presented in Volumes II 1 and 2 parallel to their textual forerunners. It completes this bilingual edition of ›Characteristicks‹. – Pierre Des Maizeaux (1673-1745), in his own time a prominent man of letters, played a significant role in the dissemination of French culture in England and the spreading of English ideas in his native France. Acquainted with him through Pierre Bayle, Shaftesbury commissioned from Des Maizeaux a translation of the ›Inquiry‹; omitting to mention that the treatise was his own, the Earl promised to give any assistance required. His favourable reaction to a first sample of the French prompted Des Maizeaux to send a further »deux ou trois Cayers«, but the work then came to a halt. In spite of Shaftesbury’s continued encouragement, Des Maizeaux apparently lost interest, and the translation seems not to have progressed beyond the passages included here in this volume.